Studying master athletes — sportspeople aged 35 and over — gives us an idea of what is physically possible as we age. 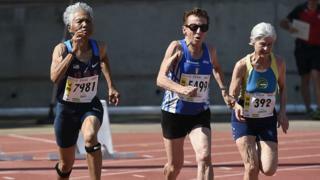 Analysing the world record performance times of each age group unsurprisingly reveals that physical ability does ultimately diminish, the older you get — but doesn’t fall off rapidly until after the age of 70. It is reasonable to assume these top athletes have a healthy lifestyle in general; as well as exercising, they follow a balanced diet and don’t smoke or drink heavily. In today’s world we have largely been able to get away with problems related to our inactivity, by leaning on the crutch of modern medicine for support. But while our average life expectancy has increased quite rapidly, our "healthspan" — the period of life we can enjoy free from disease — has not. Most people should not be aiming to become a world-beating athlete in their advanced years; they don’t need to be to reach optimal health. Instead, incorporating small regular bouts of physical activity — brisk walking or ballroom dancing — into your routine is the key. Physical activity is one of the cornerstones of a healthy life. Even if you can’t be a competitive athlete, starting to regularly exercise in your 20s and 30s is likely to pay off later on. And if you’re past that point, just gently becoming active will do a huge amount of good. Stephen Harridge is professor of Human & Applied Physiology at King’s College London. Norman Lazarus is Emeritus professor at King’s College London and is a master cyclist in his 80s.